Harriette: Halfway into the boat journey and already we’ve taken hundreds of photos of the movie-like surroundings. We get off the boat, put on our packs and set off into the wilderness. When we arrive at Clinton for our first night I’m really surprised. Although where we’re staying is basic, it has a natural vibe that I like. There are cooking facilities, bunk beds, wood burners, toilets and a communal area with solar lighting at night. Mark: The walk up the Clinton River Valley is one of my favourite parts of the track. We are hemmed in by steep hills on both sides, with cascading falls around us. It rains about 180 days a year here, but don’t let that put you off – the downpours are what give this enchanting place its magic. That said, a good raincoat is handy. 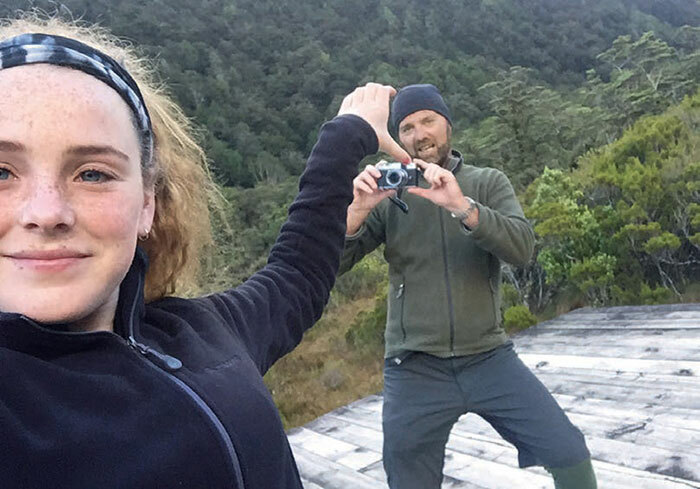 Harriette: We reach Mintaro Hut after six hours. Lake Mintaro is nearby; the water is clear and looks inviting. We can hear native mountain parrots – called Kea, apparently – overhead. They look cool, but Dad says they’re known to steal walkers’ socks and boots! I keep my eyes peeled. Mark: Harry is on fire. Not literally, it’s too wet for that, but she is racing ahead. Occasionally, the clouds lift and we get stunning views across the valleys below and spot snow-covered peaks in the near distance. 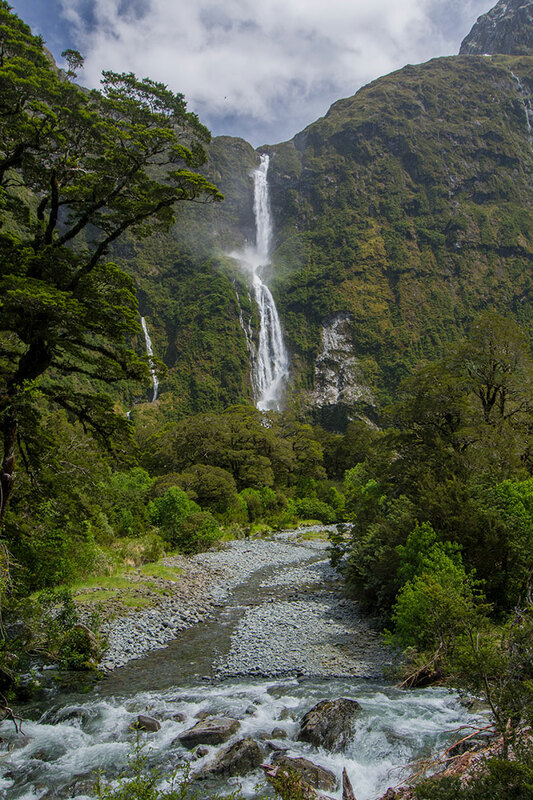 Harriette: Although I already had aching legs, we head on to Sutherland Falls, thought to be the highest waterfall in New Zealand. Way before you see them you feel their spray, and hear them roaring and crashing in the distance. Mark: The Mackay Falls are the highlight of the walk today. We soak up their cascading beauty, but don’t linger too long. We need to get to Sandfly Point in time for the boat to take us on the short journey to Milford Sound. 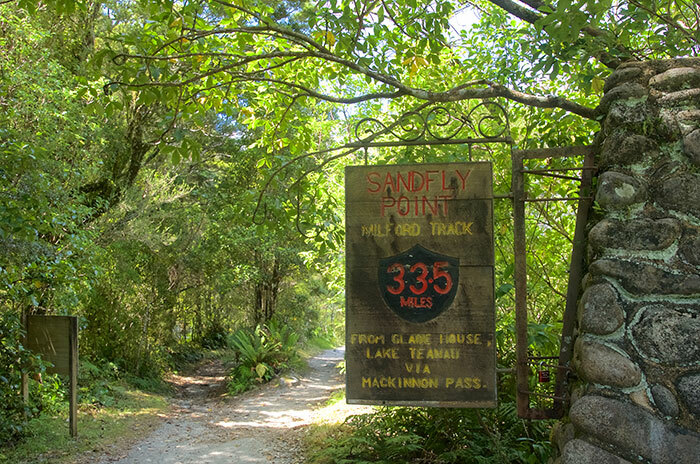 Harriette: The name makes sense when we arrive: there are millions of sandflies everywhere! I have to squint to keep them away, but I still manage to get a photo with the finishing sign. I hop on to the boat proud of what Dad and I have achieved, and looking forward to our next adventure. Planning a hike along the Milford Track? Make an appointment with one of our Travel Experts to find out more about embarking on a tramping Journey around New Zealand's South Island.